The What: Arlington has launched the recessed In Box Cover Kits, designed to improve installation of a receptacle in the company’s FLBC4500 floor box for new concrete (sold separately) and other manufacturers’ boxes. 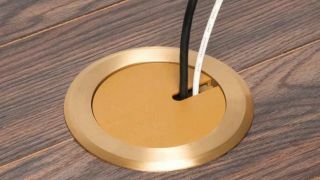 The What Else: In Box is recessed and installs into the can, and is designed for both aesthetics and safety—reducing the tripping hazard presented by plugs sticking out of the box. They also present the option of having power and low voltage in the same box. The Bottom Line: In Box is available with metal flanges in brass or nickel finishes, as well as in plastic with a choice of light almond, gray, caramel, black, and brown finishes.